"You must also envision the impact you’ll have on your world as a result of living your purpose. Your actions—not your words—are what really matter." Being connected to your purpose not only puts you in the driver’s seat of your life, it also provides clarity and direction for where you are heading. 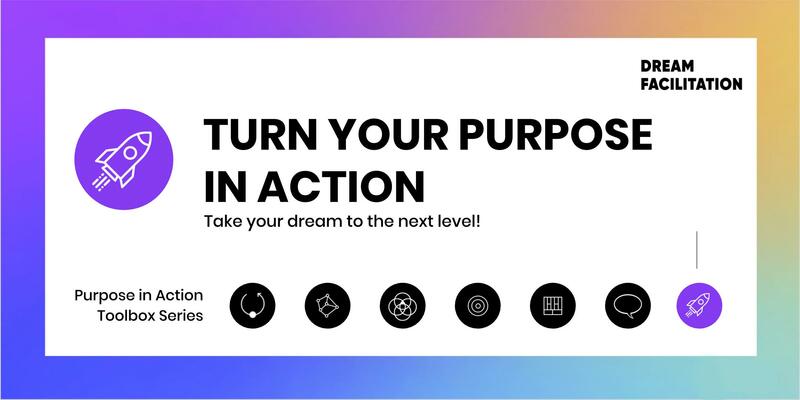 The Purpose in Action Toolbox workshop gives you what you need to start living your life in a more meaningful way by connecting you with who you are and what you want in life, and by teaching you how to take action, starting today. After having clarified your purpose, structured your dreams, and finding your inner voice, now it's time to envision your goals and start prototyping your business, your projects or personal growth. In this session they will clarify a vision and intention for the future (short & long term) and develop an actual plan to translate an idea or a concept into experimental action. Focus and direction defining your short and long term objectives. An action plan to implement projects, businesses or personal transitions. Incorporate meaningful, purpose-infused language to create a document that speaks to you, not just to any person in your job or role. Feel empowered and confident to take action towards implementing your project. Leave with fresh perspectives and insights that will open you up to new ways of thinking, expanded possibilities, and an empowered connection to yourself, your relationships, and your impact on the world.